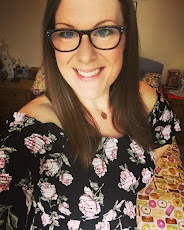 Those of you who read my blog regularly will know that I'm due to give birth to my first baby in just over 5 weeks time. My husband and I are very organised, and have pretty much all the baby-related stuff organised and ready for our little bundle. I like it this way - organisation is my safety-net - it makes me feel calm and in-control, and it helps keep my mind (and house) uncluttered. Because we are an organised pair, I don't feel too worried about the prospect of the baby coming early as I know we are ready for him. Being organised means that I can stay at work until the end of term (7 working days left until I start maternity leave -woo!) without stressing that I have everything to sort out when I finish, and should mean I can get other smaller jobs done before baby arrives. One of the jobs I wanted sorted before our little Mr makes his appearance was some titivating in our garden. 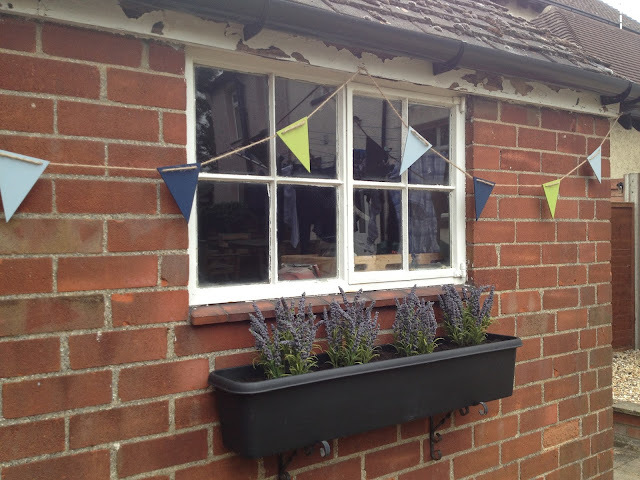 With this lush weather we've been having hubby and I have been spending loads more time in our lovely garden, and the more time I spend out there the more ideas I have about how we can improve it. 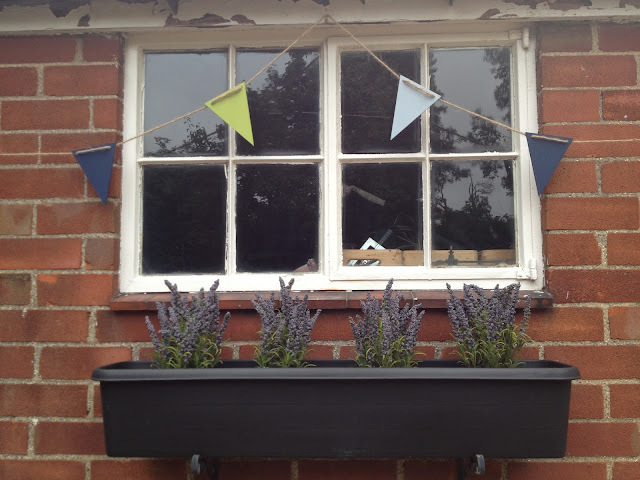 I am by no means at all a gardener of any shape or form; I tend to kill everything except weeds, and although I love flowers my fingers are definitely not naturally green.So for us its about having a hassle free, low maintenance garden for enjoying, rather than a garden to work in. 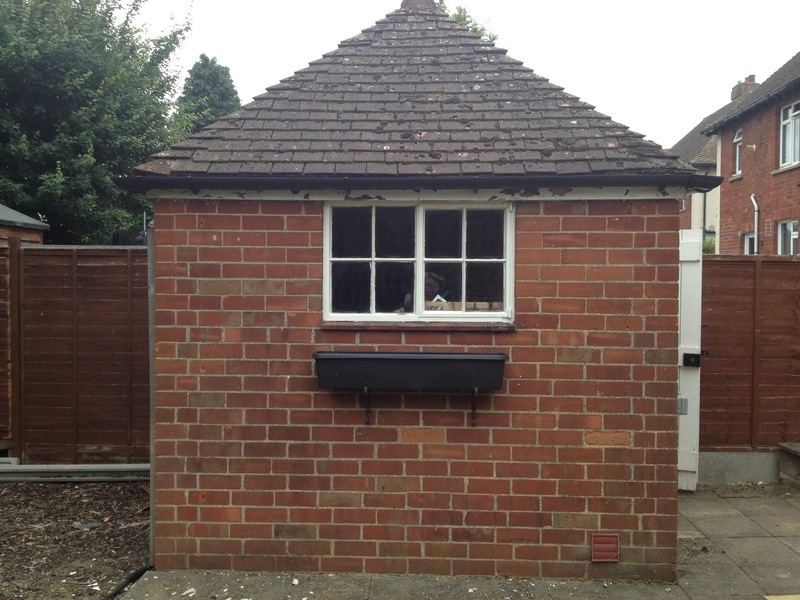 We have a lovely brick-built shed in our garden which is hubby's domain - full of all that 'man stuff' they love to keep. 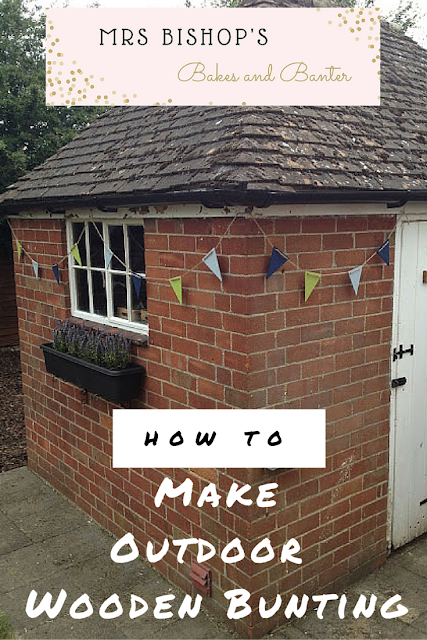 For a while now I've been wondering how to decorate the outside of the shed so it becomes a feature of the garden. Then I came across some wooden bunting online and thought "wouldn't that look lovely across my shed" - but alas it said only for occasional use outside :-( ... and most of the strings I found cost at least £15-£25... not an amount I'm prepared to pay when I'd only be able to put it up outside occasionally. I wanted something robust that I could leave out in my garden all-year-round. 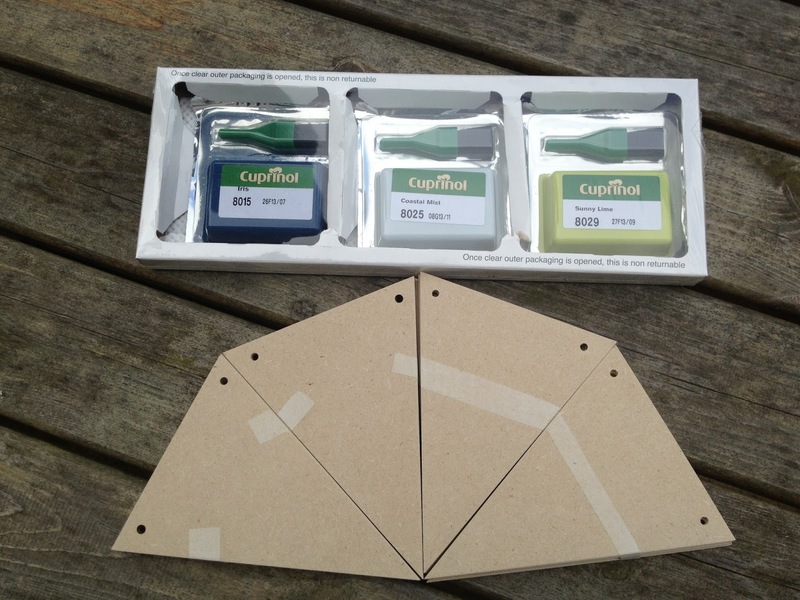 So I got my thinking cap on and I did some searching online and soon enough I found some pre-cut wooden bunting flags on eBay, some hardy garden string/twine and found that Cuprinol have an amazing array of brightly coloured garden shed paints which you can order in tester pot size - score! And we got to work - it was such a fun task, and very quick - the bunting flags dried over night in this awesome heat, and hubby had it strung up the very next evening. Garden shed before shot - plain and boring with an empty window box. 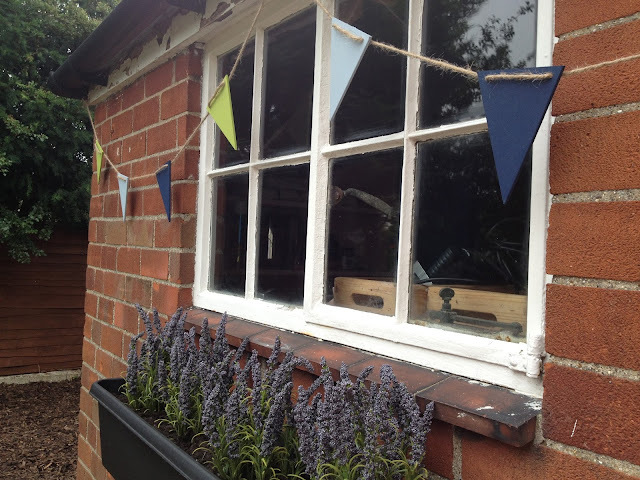 Our homemade outdoor bunting & lavender window box. 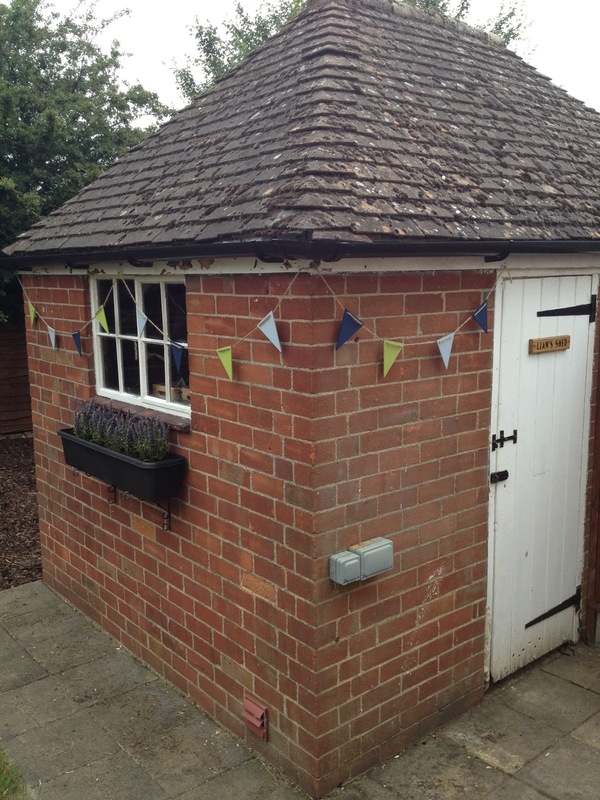 The titivated garden shed - very pleased! 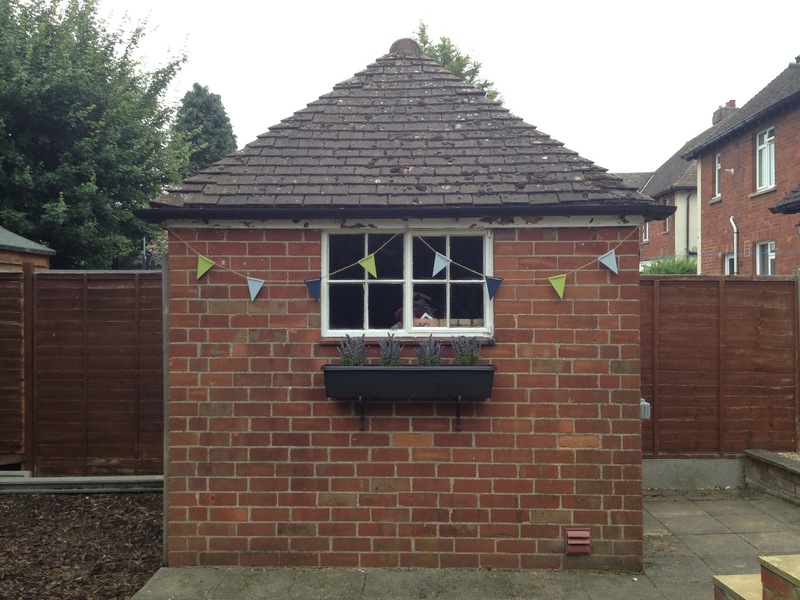 the after shot - all tarted up and ready for summer! I'll definitely be making some more outdoor bunting, perhaps to go along my garden fence, and maybe some for gifts, and for inside the house...the variety of wooden flags you can find on eBay is immense - hearts, rubber ducks, trains, fairy princess castles, letters - you name it! So Cuprinol can be expecting lots more tester pot orders from me in the future! 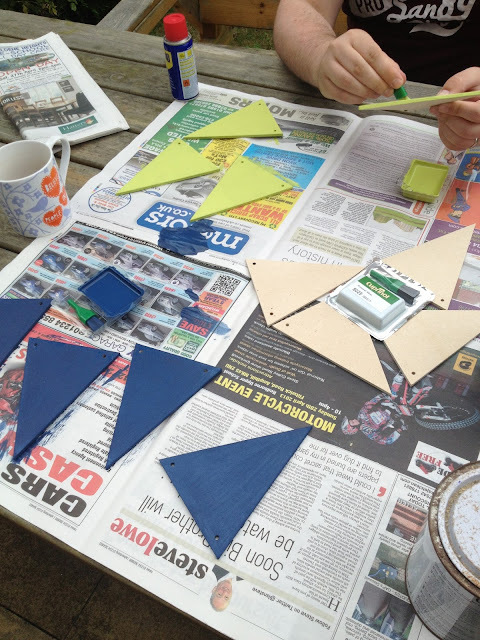 Are any of you in the middle of little DIY projects? I wonder how many jobs like this I'll be able to fit in before baby arrives? I am copying this idea immediately! I made mini fabric bunting to go under the eaves of Evie's playhouse, but some lovely wooden bunting would look great on the outside. Off to ebay now!! 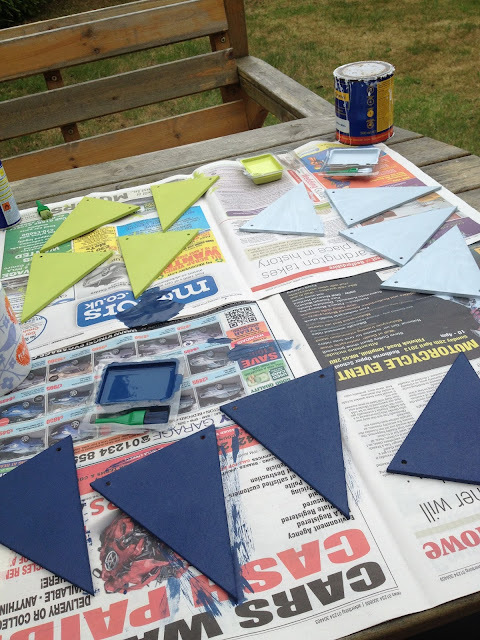 Your bunting looks great! Loving the colours! 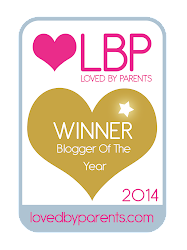 Thank you for linking to my blog. Wishing you a wonderful day in the sun!